I seriously think there's something wrong with the electrical wiring inside my office simply because the light bulbs of the wall lamp there just don't last long enough compared to lights in other parts of our home. Sometimes I'd replace a bulb inside my office in the morning and by nightfall when I switch it on; the bulb explodes; scaring the wits out of me with a loud bang! And then there was the time when I was happily typing at my desk and the light bulb of the wall lamp suddenly exploded and hot glass showered all over my desk! Fortunately I was not hurt in that incident but I almost had a heart attack from the shock! So right now I'm sick of my wall lamps and I'm considering getting a floor lamp or a desk lamp for my office. If my wall lights decide to act up again, I have something else to fall back on. Currently it's just the wall lamp so when that goes pop, I'm left in the dark inside my office. Home lighting is what I'm all about this weekend. Indoor lighting, table lamps, landscape lighting and outdoor hanging home lighting, I was dazzled by all the lights I found online. But as always, one stood out from the rest and I'm very much enticed by this pretty Quoizel AR149K Salamander Stained Glass Task Lamp. Quoizel is not just about lighting and home accessories. They create timeless pieces designed with you and your lifestyle in mind. 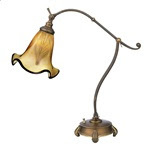 A great classic look befitting almost every interior, this lamp and so many other brands can be found at lightingsale.com. There's a 20% Labor Day discount for purchases over $200 so hurry! Oh no…I received a reminder for this one Ane, so had to quickly do of coz lol! I'm sitting with Allie watching "Hannah Montana" right now.. She slept late in the evening.. and woke up around 9pm.. so she's super wide awake! That's such a puurrrrty table lamp!! :) My mom would love this and I know just the perfect place where she can put it! but mesti expense kan marzie?? I finished my PBs already.. no more new PBs for me this month, yet.. I just finished watching Nurkasih GP.. best!! Whew! I am glad Lucas is asleep now Shem!! :-D Is Allie sleepy yet? oh my god.. luckily you are not hurt mariuca.. your blog so fast ppl comment eh? I thought i was 1st ekekeke... sorry for not visiting you long time.. sooooo long rite.. miss the comment frenzy at emilia's blog ehehe.. you know what i mean rite :P happy ramadhan to you and selamat hari raya in case i forget later huhuhuh.. nice to see you are active and well.. go go go mariuca..
Oh Yay for BTP, Marzie... They seldom give opps to me too Shem..
Sedapnye bubur pedas… I got pizza LJ he he! Wah LJ got how many more??? 12?? OKB! Yeah lor…payu loves u and LJ, no worries! I saw a little NK last night LJ!!! They gave a batch to MD, Ane, nothing for the other two though…. Hahah GP.. yelah. strange and weird things. hehhe.. move lah.. lol! Allie throwing tantrum it seems LOL! LJ, that’s what my fren DD is doing….happily moved house and renting out her unit! I have always wanted to have a table lamp...but I never had the chance to do so. Ha :D Perhaps it was I don't need it. That is dangerous la. Better be careful. Ask some wiremen to go and check. Speaking of exploding light bulb, now that reminds me of "Haunting" shown on Star World. MAcam ada satu rumah ni, kat loteng dia, bila pasang jer lampu pasti meletup. Dalam siri haunting tu la, katanya ada negatif energi tu. huhu. Negatif energi disebabkan entiti bekas2 orang gantung bunuh diri. Hehe. Jangan pulak caya sangat mender2 ni yer..
Marzie, jangan tidur lambat2 tau, nanti dok sibuk2 blogging, ada jer kelibat hitam tengok you blogging. hehe. Eh Rizal trying to scare me it seems astaga….dah la I’m scaredy cat, sure bukak semua lampu tonight huhuhuu yowzaaaaaaaa!! Everybody needs a table lamp Tikus he hee! Buy one today LOL!